BROCKTON -- Pete Damon will go to the Fenway Park mound this afternoon to throw out the first ball before the Red Sox-Orioles game with his wife at his side. Jenn Damon will tote a backpack stuffed with the necessities: a screwdriver, a piece of Kevlar string, a cable, and a spare arm. ''The thing has a tendency to break at the worst possible time," Damon said yesterday, after throwing Wiffle-ball batting practice to his 7-year-old daughter, Allura, in the family's backyard. ''The string's going to break. I know it is." The 32-year-old, in his parlance, is ''a lefty, but I used to be a righty." That changed for Army Sgt. Peter Damon in the fall of 2003 in a former Iraqi air force bunker converted to a US Army hangar. A lifelong resident of Brockton, Damon had enlisted in the National Guard in 2000, shipped out to Kuwait in December 2001, then Camp Anaconda in Balad, Iraq, in October 2003. A helicopter mechanic, he was assigned to inspect for corrosion, cracks, and assorted damage. Army helicopters required scheduled phase maintenance every 250 hours, Damon said, and he and a crew would disassemble each part -- the transmission, blades, landing gear, and more -- then reassemble that component of the aircraft. ''For three weeks, we were doing unscheduled maintenance," Damon said. ''We were waiting for a phase." A UH-60 Black Hawk finally arrived for phase maintenance Oct. 21, 2003. ''A UH-60 has three wheels, two in the front, one in the back," Damon said. ''We put a jack in each point. Me and another kid, Specialist Paul Bueche, were working on the right side of the landing gear, changing the brakes out. ''This is where I don't remember much." Damon was filling a tire with high-pressure nitrogen, and while inflating the wheel, ''it exploded," he said. ''What actually exploded was the rim. When that blew up, it severed the hose. The nitrogen was spraying around like a wild snake. It was blowing dust everywhere, because there's dust everywhere." His memories of those chaotic moments, he acknowledged, have gaps, filled by stories he's been told by people who were there and by reading the army's report. ''I do remember some things," he said. ''It's like a dream where you don't remember everything that happened in it. I knew my arms were gone. I remember running and screaming and hollering -- I guess I was conscious, but I was in shock. I remember looking down and seeing the stumps all bloody. It's just a real quick flash. ''I guess guys grabbed me. I was running around yelling for people to pick up what was left of my arms. They were, they were trying to find the pieces. Paul, they found him later." Bueche, 19, was hit by the propelled rim and killed. Damon was transported in a Humvee to a combat support hospital in Balad, then transported to Baghdad by a Black Hawk helicopter. He remained in the capital city for a day and a half before being flown on a C-141 Air Force transport plane to Germany, where he spent four days. He was relocated to Walter Reed Army Medical Center in Washington, Oct. 27, 2003. Exactly one year later, the Red Sox celebrated the World Series and Damon was still at Walter Reed. He wouldn't leave until Feb. 5, 2005. His left hand and wrist were gone. His right arm was blown off just above the elbow. An inch or so of that arm was shaved down to fit a prosthetic arm. He needed two full months in Walter Reed's Ward 57 -- the amputee wing of the hospital. ''Once I proved I could take care of myself hygienically, they put me in the Malone House, meant to be guest house at Walter Reed," Damon said. He underwent therapy, both physical [weight lifting] and occupational [learning how to use prosthetics]. ''Then I learned how to tie shoes, button buttons, cook," he said. ''With both my arms on I can," he said. ''I got some with Velcro on them. There's a lot of things I still can't do. I was an electrician. I was aspiring to be a full-time aircraft technician. I loved working with my hands, getting my hands dirty." Even today, there is a bone spur poking through the skin at the end of his right arm that probably will have to be surgically shaved. A bubble that formed at the end of that stump burst three months ago and has yet to heal. Damon usually wears only one arm -- the left. The end of that prosthetic arm isn't a hand but two pieces of metal -- quite similar to tongs one might use to flip meat on the grill. When he saw his family following the accident, he said, ''My daughter was a little freaked out. She didn't say anything. But it only took her an hour or so to warm up to me." Damon accepts that he'll never be the aircraft technician he wanted to be. He'd landed a temp job doing just that at Camp Edwards on the Cape in the fall of 2001. His life was falling into line, and he was pleased. A high school dropout at age 16, Damon, by his late 20s, saw himself ''going down the wrong path" and had done something to change it. ''I don't want to say I was a troublemaker, but I was going down the wrong path," he said. ''My wife and I weren't married but we had a child and we were split up. I didn't want to be one of those dads who just visits on the weekends. To get my act together, that was one of the things I did, joining the National Guard. I thought it would restore some discipline in my life, and it did." But then came Kuwait and Iraq and Walter Reed. Today, Damon -- who also has a 3-year-old son, Danny -- is enrolling in Veterans Upward Bound, a program at the University of Massachusetts-Boston that prepares veterans for college. His education will be paid for, he said, and he's contemplating attending UMass or Bridgewater State College. ''I like art," he said. ''I used to draw before, and I can still draw now." There is a sketch in his living room of a soldier carrying another soldier on his back, evidence the righthanded Damon can still draw, though he must clasp his pencil between two pieces of metal. ''Maybe I can major in graphic design or graphic art, maybe get into that sort of field," he said. The drawing he's working on will be used in an advertisement for Homes For Our Troops, a nonprofit organization that uses donations by contractors to build homes for veterans. The Damons will be moving into a new home by the end of July, a place equipped with easy-to-open cabinets, latch-handle doors, keyless entry, low-maintenance vinyl siding, an easy-to-clean flat-top stove, and a master bedroom suite with a wide shower. He has a 2001 Toyota 4Runner, which he and his wife drove to Savannah, Ga., and a tiny town outside, Mobile, Ala., last week. Damon was shipped to Kuwait out of Savannah's Fort Stuart, and last Tuesday they drove 24 hours straight to visit Savannah just before Memorial Day weekend. ''I felt a connection to the place," he said. ''It was like retracing my steps. I love that place." Then, on Saturday, Pete and Jenn Damon drove to Daphne, Ala., to meet with Paul Bueche's mother, father, sister, and sister's fiance. ''They were very nice people, very sweet," Damon said. ''Memorial Day was the first time I went to his grave. It just hit me now. It was very touching and very good closure, I guess. I've had a lot of feelings of guilt going on, maybe, if we just did this right . . ."
But Damon lived, and he doesn't feel cheated. ''I don't feel bitter at all," he said. ''I feel it's a wartime. These helicopters need to be up in the air. Maybe it didn't need to cost someone their life and me my arms, but these helicopters being up in the air are the reason there are so few casualties. We were just doing our job. I still think joining the military was the best thing I did in my life." This afternoon, Damon will worry about his mechanics. He is convinced that his arm will fail him, a worry familiar to major league pitchers and guests throwing out first pitches. The device itself is a prosthetic forearm that latches onto what remains of his lower left arm. Underneath the Johnny Damon jersey he will wear -- there is no relation between Pete Damon and the Sox center fielder -- will be a black harness that fits around his shoulders like backpack strings. 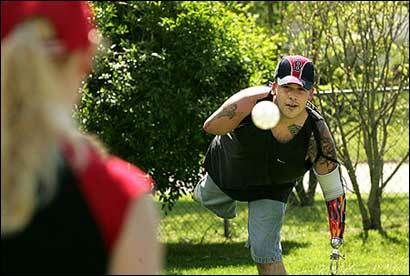 By flexing his shoulders and upper left arm at the same time, a Kevlar string will allow him to pick up the baseball. ''When I want to let go, I just let off on it," he said. He thinks he can throw 50 feet, but he hasn't practiced with a real baseball in more than a week, thanks to the family's Jack Russell terrier. ''We had a baseball," Jenn Damon said, ''but the dog chewed it up." The White House Commission on Remembrance, which honors fallen veterans and recognizes current military personnel, might be more worried than he is, he said. ''They keep asking how far I can throw it," Damon said. ''What, do they want me to pitch in relief? I think I can throw it 50 feet or so. I was there Opening Day when they had Bill Russell and Bobby Orr out there. ''I think I can throw it the same distance they did, halfway to the plate. No problem."